Hello! And welcome back after my Easter Sunday off: even bloggers need a break sometimes, right? I think that my Sunday 7’s generally seem to be random stuff which has caught my eye over the past week from my ‘New in’ emails, magazines and of course my Instagram feed. However, I often bang on (and on and on…) about being small, short… extra petite and so this week, I dedicate this entire post to any fellow vertically challenged lovelies out there and am bringing you my favourite pieces from Petites ranges. After all, ‘petites’ is my niche, right? Gasp! They’re not wide leg crops! And boom! Suddenly a very ordinary looking pair of trousers look freAkin cool, right? I can imagine these looking fabulous with all manor of flat footwear, but also pretty lush with some strappy heels. 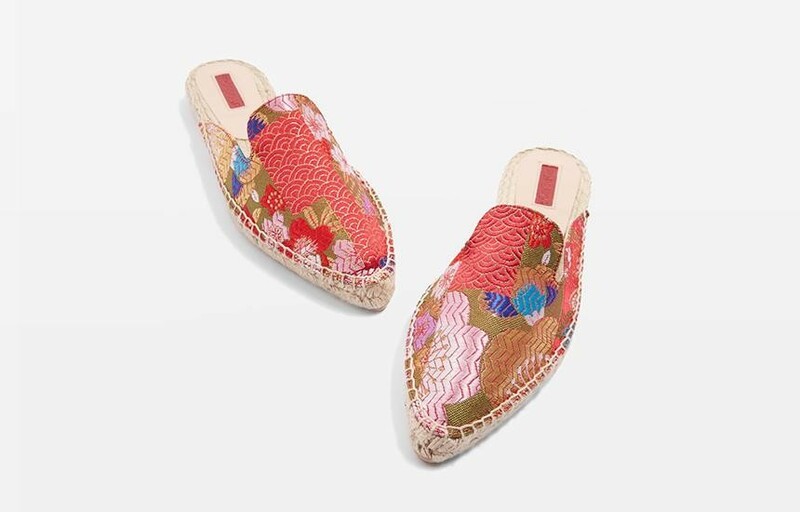 These would certainly be my number one today – but they are only available in size 8 and 14 online. I phoned TS customer services to find out if I could get a store transfer because from the Topshop website, these trousers were still available in Oxford Circus and a few other London stores; apparently Topshop themselves don’t offer store-to-store transfers, however, I was given 4 direct store numbers as a starting point to see if I could persuade (i.e. beg) a store to help me out. After over an hour on the phone, the fourth and final store, Guildford agreed to do the transfer… but it would take UP TO SIX WEEKS! I’m somewhat resigned to my fate… that perhaps somehow the transfer won’t come off. Mr T is going into Central London on Thursday for one of his Whisky events but has point blank refused to take a small detour to Oxford Circus and arrive at his event with a Topshop carrier bag in his hand. Anyway – Topshop do have the super useful facility on the website of checking for items in your local store – I can tell you off the top of my head that these were available (as at Tuesday this week) in Selfridges, Kensington, Oxford Circus, Guildford and Manchester Arndale Centre, in most sizes. What’s stopped me from buying it is that I rarely wear dresses. 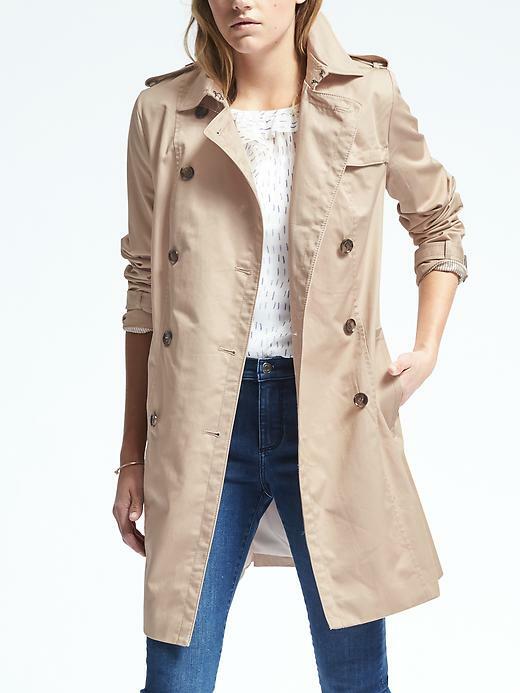 A classic trench is an incredibly useful coat to own – and this is the one I have been lusting after: no sleeves to take up, no need for shortening… but of course it comes at a price: £125 is a lot more than I want to pay for a trench… I resent it in fact, when there are some really good, affordable ones in the likes of Zara or H&M etc. However, that said, it is an investment and would last years no doubt. Another useful item in any wardrobe! I have extolled the virtues of a jumpsuit in a previous post… that this one is petite makes it a winner in my book! Plus, it has great reviews… there is another good looking Khaki jumpsuit on the Next website, but alas, apparently the fabric creases just by looking at it… however, if you can cope with that, it’s another great looking jumpsuit. Slightly smitten with these… they’re just pretty cool… and bargainous to boot! 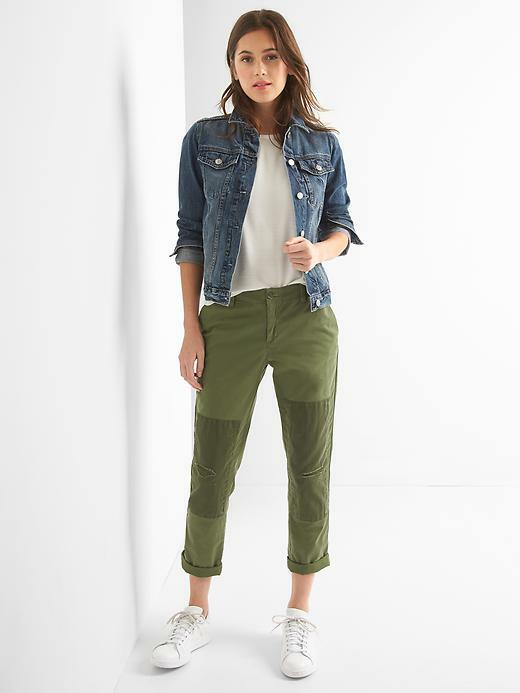 I’ve put these chinos in the list simply because Khaki seems to have become my Spring/Summer black… but in actual fact, Gap are brilliant for all sorts of petite trousers and jeans in every shape and colour imaginable. 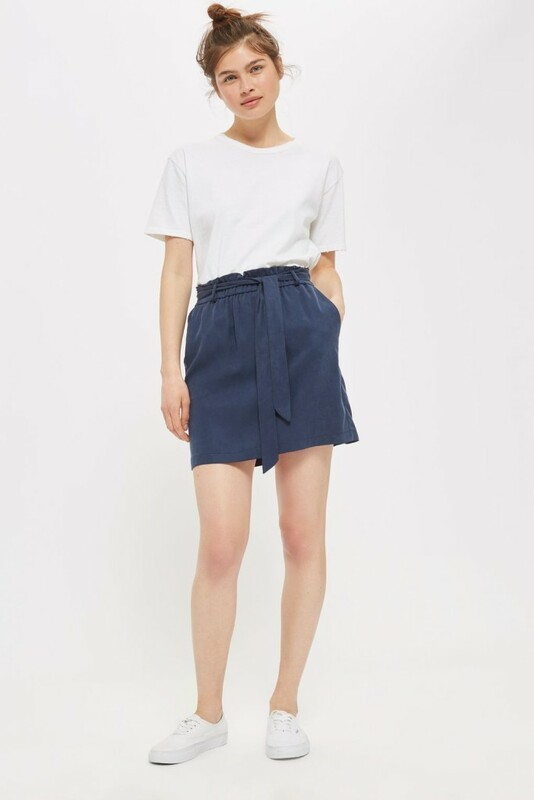 Love this little skirt… and yes, it is a little on the short side, but having tried it on (no pics of it though – sorry), I genuinely think it’s the perfect little skirt for anyone 5’2″ and under. Are you ready for this week’s numero uno? Loving this ‘mimosa’ yellow midi dress with it’s flared skirt and tie waist: it would flatter most shapes and sizes. If you are worried about showing the top of your arms off, don’t! This dress would look perfectly styled over a little white tee or cap/short sleeved peter pan collared number too. So moving onto Stinker of the Week: I mean, where to start?! And so, that’s another reason Boden get’s my number one slot this week – there’s no patronising us shorter ladies with only the shorter version of the dresses: yes, the petites range is a limited range, but if it’s available in regular, it’s available in petite, regardless of length and colour. Actually Topshop are pretty good like that most of the time as well – though they occasionally seem to decide that Petites can have a different colour to the regular range which really gets my goat! 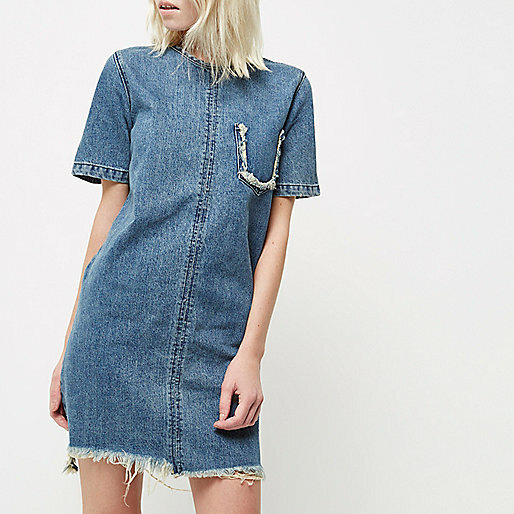 There’s absolutely nothing I love about this dress… and I love blue and denim, just not this wash of blue denim! And perhaps I’m being unfair. I mean, I got irrationally excited that River Island were going to be launching a Petites Range last year… why I got so excited I don’t know, given there is rarely anything in the regular range which is my kind of vibe. Rather tragically, do date, there hasn’t been a single thing from River Island’s Petites which has caught my eye – it’s very much targeted at a younger, clubbing kind of market. And finally, my Wild Card item this week… it’s not so much the item which is ‘wild’ exactly, it’s my choice of store: M&S! So M&S… where to start?! They (as in, M&S) frustrate the hell out of me with their vanity sizing – you have to size down with pretty much everything (kids, mens, ladies…) and when a 5’10” size 12 blogger tells you to ‘size down – this is an 8 I’m wearing’ you know there’s no hope in M&S for someone of my build, right? As a size 6… what should I size down to?! The entire Petite’s range at M&S is ill-thought out in my view; so random… there’s no cohesion to the range; no ‘build yourself a capsule wardrobe’ from petites; in fact, from the 86 items in the M&S petites range there are just TWO skirts, which are both very office-y; one is navy, the other black, and both pencil skirts. As an example, why can’t we petite’s have something cool like the Autograph Cotton Rich Wrap Detail A-line Midi Skirt? 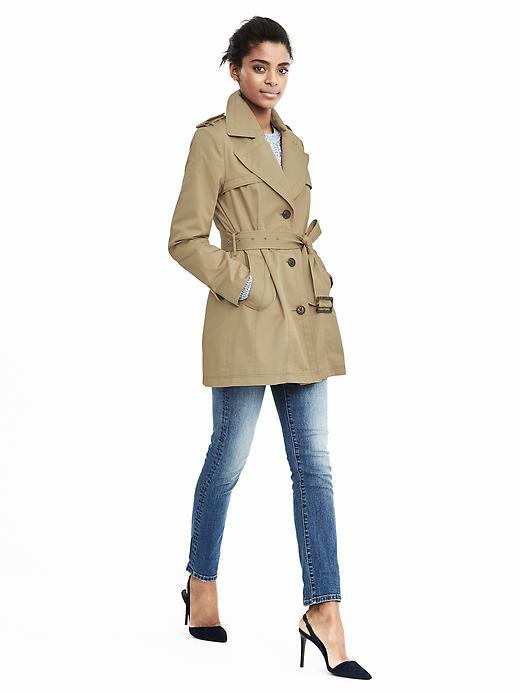 Is it *SO* unthinkable that shorter ladies like fashion too?! Clearly, M&S have no-one knowledgeable ‘curating’ the petites range, if indeed it’s curated at all! Much has been written by both fashion journo’s and bloggers alike about how M&S should reduce the crud / number of ranges… they could do worse than taking a leaf out of Boden’s book and having everything from the Limited Edition or Autograph range in Tall, regular and petites and simply scrapping everything else. 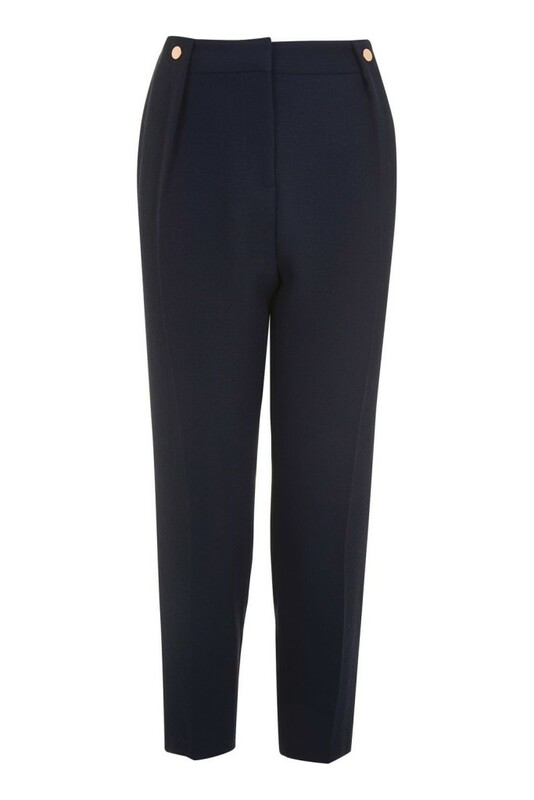 Anyway… back to these, trousers… even the name makes them sound frumpy: ‘Linen Rich – Tapered Leg’! So, I’ve tried really hard here – because these trousers aren’t exactly my favourite-favourite – they’re not truly proper peg-leg, and neither are they properly cropped nor long… bit of a styling challenge really! I’d remove that nasty looking rope belt for a start! And perhaps roll the hem over a couple of times for that beachy look? 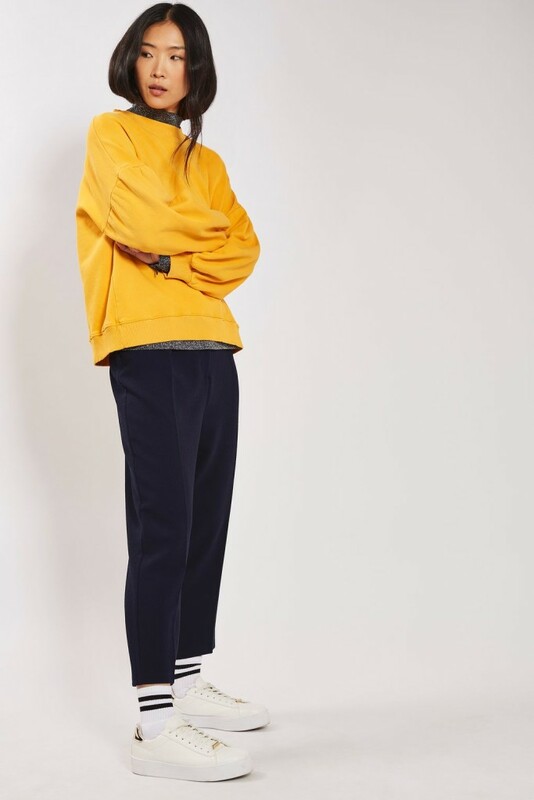 Look 1 – Casual and Comfy: I think these M&S trousers look comfy, so would be perfect with a cosy sweatshirt like this Topshop Petites Feminist Sweat (£24) and a pair of Superga 2754 cobinu white mid tops (£30). A little shopper/tote would look cute with this look. 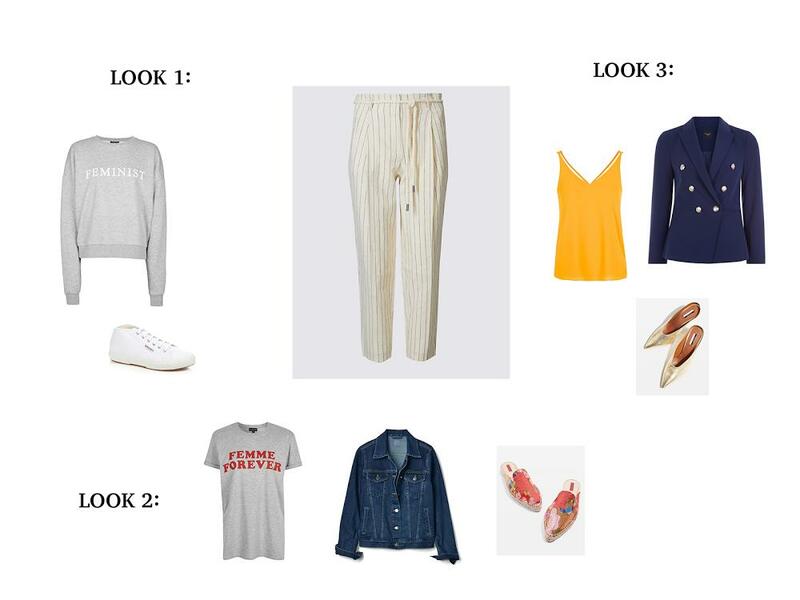 Look 2 – Going to the Market: How about teaming the trousers with a darker grey (still slogan) tee like the Topshop Petites Femme Forever tee (£15), throwing a Gap Petites Icon Denim Jacket (£54) over the top and some snazzy, pointy, mule style Topshop Knight Pointy Espadrilles (£52). Just add a basket bag to finish the look off. Look 3 – #Outout: Yellow would work brilliantly with these trousers. Something like this Topshop Petites Double Strap V-Front Cami (£16), with this lovely navy New Look Petite Military Blazer (£34.99), and some gold (which is a neutral!) Topshop Juicy V-Cut Mules (£54). I think a clutch in most colours would work here. And so that’s it for this Sunday: what did you think? Love hearing from you, so please do leave a comment. Apologies for poor old M&S getting short-shrift from me this week, but they are one hell of a frustrating store in my eyes… they’ve had sooooooo many good opportunities to turn things around but have been too afraid to upset the ‘purple pound’ so to speak, which of course has left them up the swannie. After all, some 5,000 stores are sadly up for the chop. And I don’t doubt the M&S in my small town will be one of them… which is a great shame: I’d love to champion M&S as it’s a Great British High Street institution. But you don’t need to be Mary Portas to realise that simplification would have been the key ingredient to maintaining a strong presence on the high street instead the introduction of more and more confusing ranges, which seems to have been the demise of M&S… oops, I seem to be ranting again, instead of signing off! Back on Wednesday or Thursday for a mid-weeker.